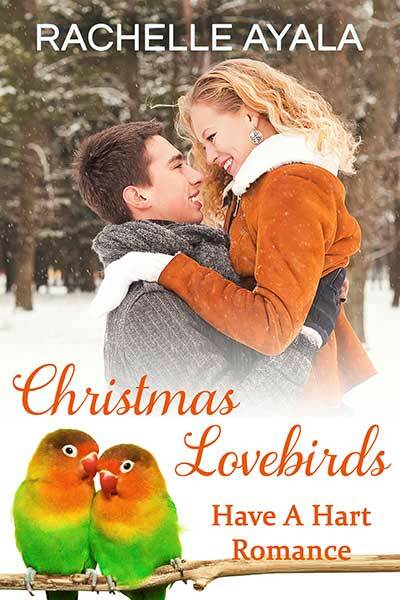 RACHELLE AYALA’S CHRISTMAS LOVEBIRDS SNEAK PEEK! I am very pleased to welcome one of my favorite authors, Rachelle Ayala. When I started Author Wednesday more than two years ago, Rachelle was my first guest. Click here to read my very first interview. Rachelle is also the reason I’ve ventured into writing romances. Through her Romance in a Month class, I learned about the genre and became inspired by her energy. She’s also the creator and leader of the Christmas Pets & Kisses box set. Today, I am very pleased to offer a sneak peek at her story in the box set. I hope you enjoy! Her entire class of kindergarteners held themselves still in barely suppressed excitement. “Can I hold her?” her most talkative student, Bree, squealed. “It’s ‘may I hold her,’ and, no, not right now.” Melisa brought her bird’s beak to her lips and let Cassie take a nibble, which was her version of a kiss. “Mean,” the children shouted in unison, startling Cassie, whose wings flapped briefly. “Will she fly?” Mattie asked. The little bird lifted her wing and spread out the feathers. “You’re stupid.” Mattie stuck his tongue out at Bree. “But I wasn’t being mean,” Bree said. “You too, Mattie.” Melisa pointed toward the boy’s chair. “Screech,” Mattie shrieked and flapped his arms at Cassie. The bird squeaked and flapped her stubby wings. She lifted straight up like a helicopter, hit her head on the ceiling and landed on the top of a row of hanging overhead lights. The rest of the class jumped up and down, pointing and yelling. “Ahhh …” the children complained. Melisa glanced at the wall clock. Ten more minutes until Christmas break. As much as she loved her students, their energy and excitement with Christmas drawing near meant they couldn’t sit still or follow directions. She passed out the green candy Christmas trees she made by drizzling melted candy over straight pretzel sticks, along with a flyer about the Giving Tree Toy Drive at the Reed Christmas Tree Farm. Bring a wrapped toy and take a picture with a pet bird, ride in a firetruck, and other fun activities. When the bell rang, Melisa stood at the door and wished all the children a happy vacation and New Year. She kept one eye peeled for Cassie, in case she made a break for the open doorway, but the little bird seemed content to perch high above her and preen her colorful feathers. Bree’s father was a war veteran who’d gone back to Afghanistan for a humanitarian trip. He’d been taken hostage by terrorists, but the news reported that he was safe and had been airlifted to Germany to be debriefed, and hopefully able to return by Christmas. “Are you going to the Christmas Tree Farm tomorrow with Cassie?” Ella took the green pamphlet from Bree and helped her unwrap the Christmas tree candy. “Bree, you want to go to the toy drive?” Ella ruffled Bree’s head. “Great. I’ll text you,” Ella said as she took Bree’s hand. Once all the students were gone, Melisa shut the door and called Larry, the custodian. 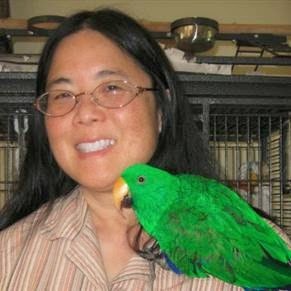 After she got Cassie down, she’d have to get her wings trimmed again, despite what the guys on the bird forum argued. Clipping was for Cassie’s safety. She’d heard too many stories of birds flying away, landing in frying pans, or crashing into windows to be persuaded by the free-flight people, especially that arrogant guy with the handle Lovebone who claimed his parrot regularly flew outdoors and hadn’t gotten lost yet. These days, anyone could say anything on the internet without proof. The bird bent low and arched her wings, shaking and considering, but unable to figure out a way down. She’d been so frightened by Mattie that instinct took over, but now that she was calm, she couldn’t bring herself to try. Melisa turned on her cell phone to check her messages. Maybe she’d ask Lovebone how he got his bird to fly to him. Dr. Rob Reed was running late. He hated evening shifts, and these days, they were getting slammed, especially with the increased ambulance traffic due to all the holiday parties and their drinking and carousing activities. He whistled for his bird, Casey, a lovebird he rescued from his irresponsible actor brother who was the king of the impulse buy. The little bird flew skillfully, hovering a second before landing on his outstretched finger. Rob was an emergency room doctor working shifts that jumped around without rhyme or reason. He’d go from twelve-hour overnight shifts, to sixteen-hour six AM to ten PM shifts, to ambulance rides to transfer critical patients. But it was the evening shifts that relegated his dating life to a big fat zero. Not that he could complain. He was making good money for a young doctor fresh out of residency, and this year, he’d purchased a cabin in the mountains near Lake Tahoe. Not bad for a twenty-nine-year-old. San Francisco General was the only level-one trauma center for the entire City of San Francisco and northern San Mateo county. Once Rob was on the job, he was on. No time for phone calls, internet, chit-chat, or even catching a bite to eat. After packing his food in thermal packs, he checked the free flight parrot forum where he was the moderator. There was a message from HaveAHart, a kindergarten teacher who was a newbie bird mama. My little bird had a fright in the classroom and she’s perched on the overhead light bar. She seems to be trying to fly to me, bending low and lifting her wings, but she’s not taking off. What do I do? Call a fireman. It’s easier for a bird who doesn’t know how to fly to go up, but it’s scary to come down. Your bird doesn’t have the confidence to fly, so to her, it’s like jumping off a cliff. He shut his laptop. There really was nothing he could do. Why did these people never listen until they were in trouble? Clipping wings was like chopping a man’s legs off. Rob was sorry he was so grouchy, but he’d bet her bird had other problems too, probably feather-picking, incessant screaming, and other pathological behavior that came from not being able to do what came naturally—fly. I love the magic of the Christmas season filled with family and the spirit of giving and helping others. From romantic suspense to sweet contemporaries, I write from my heart and love to include children and pets in my stories. My stories range from steamy to sweet, so be sure to check the reader’s guide at my website. This entry was posted in Uncategorized and tagged Christmas, Christmas romance, contemporary romance, holidays, lovebirds, Pets, Rachelle Ayala, romance. Bookmark the permalink. ← HOW ABOUT ANOTHER SNEAK PEEK AT CHRISTMAS PETS & KISSES?